The benzimidazole ring is a significant pharmacophore in contemporary drug discovery. A variety of benzimidazole are in use, like thiabendazole and flubendazole (anthelmintic), omeprazole and lansoprazole (antiulcer) and astemizole (antihistaminic). The chemistry and pharmacology of benzimidazoles have been of great interest to medicinal chemistry [1,2] because its derivatives possessed various biological activities such as antioxidant [3,4], antimicrobial [5–10], antihelmintic [11–13], anticancer , antihypertensive , antineoplastic , anti-inflammatory [17,18], analgesic , antiprotozoal [20,21] and anti-hepatitis B virus activity . In addition, a large number of antibiotics contain the 2-azetidinone (commonly known as β-lactam) moiety  such as penicillin, cephalosporin and carbapenem. It is also associated with a variety of therapeutic activities [24–28]. In continuation of this work, the study has been done to develop potential relation between some theoretical quantum chemical descriptors and their anti-bacterial activity of some derivatives of the structure type containing the above mentioned moieties. The present study relates the antibacterial activity of the thirteen heterocyclic compounds with benzimidazole and their beta-lactam derivatives. The parent structure of this hetero cyclic compound has been presented in the Figures 1 and 2. The derivatives of bio active hetero cyclic compounds which have been used in this study are arranged in the Table 1. Some inherent properties encoded in the structure of these molecules as some well-known quantum chemical descriptors was evaluated and modeled with the experimental activities have been collected from literature [29-31]. 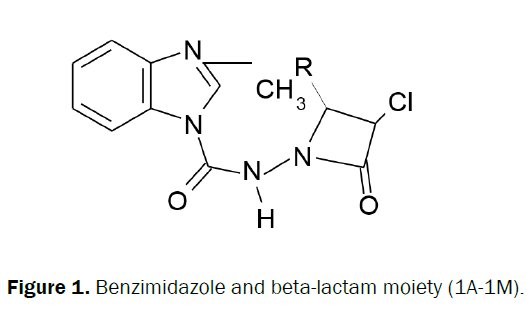 Figure 1: Benzimidazole and beta-lactam moiety (1A-1M). Figure 2: Optimized picture of 1A-1M. Table 1: Calculated values of ionization potential (I.A), Electron affinity (E.A), hardness (η), Softness (S) in electron volt and dipolemoment (μ) in Debye. The 3D modeling of these bioactive compounds have been performed with the help of Gaussian 09 software . Gaussian 09 software  has been used to calculate the global descriptors by using the DFT methods at B3LYP/6-31 G* basis set. Where εHOMO and εLUMO are the orbital energies of the highest occupied and the lowest unoccupied orbitals. Where E, N, v(r), I and A are the energy, the number of electrons, the external potential, the ionization energy and the electron affinity of a chemical system respectively. Softness is a reactivity index and is defined as the reciprocal of hardness, S=(1/η). The observed activity and as well as the quantum mechanical reactivity descriptors such as Ionization potential (I), electron affinity(A), global hardness(η), global softness (S), and dipole moment (μ) are also presented in Table 2. Table 2: Anti-bacterial activity and Antifungal activity of compounds (1A-1M). Also use Minitab17  to perform the MLR (multi-linear regression) for the calculation of the different co-efficient presented in Tables 3-5. Table 3: Regression Analysis: S aureus versus IE, S(ev), dipole moment. Table 4: Regression Analysis of S. mutans versus I.E, S(ev), dipolemoment. Table 5: Regression Analysis of B. subtilis versus η(ev), S(ev), I.E. 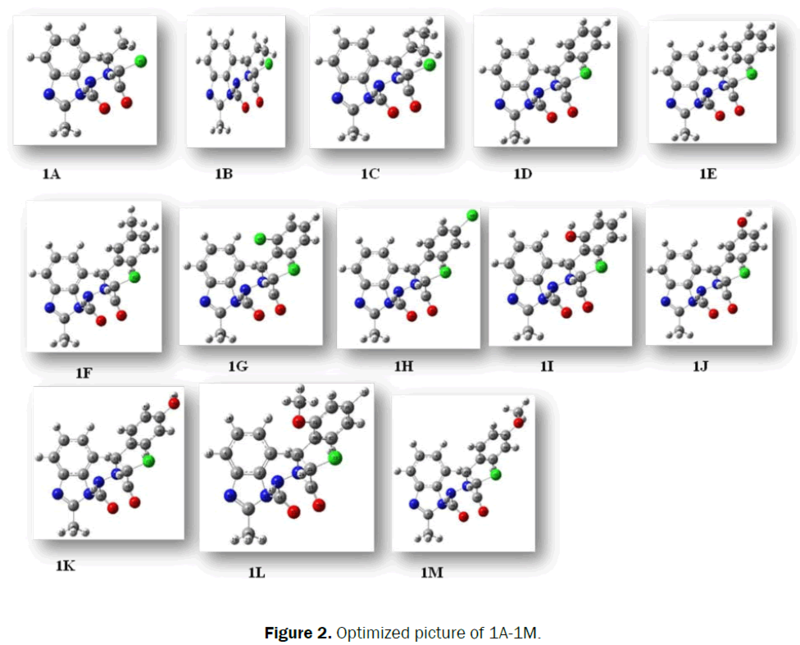 To model the relation with the computed values of different well known quantum chemical descriptors of the compounds (1A-1M) having anti-microbial activities are interrelated with the gram- positive (S. aureus, S. mutans and B. subtilis) bacteria via multi linear regression. The R2 values obtained from the regression result for the each sets, S aureus versus I.E, S (ev), dipolemoment; S mutans versus I.E, S (ev), dipolemoment and B. subtilis versus η (ev), S (ev), I.E having values 66.92, 62.38 and 60.81 respectively revels the efficacy of the model. A combination of several quantum chemical parameters to form a composite index, which could be correlated to the experimental drug efficiency, often provides valuable information on the relationship between quantum chemical parameters and experimental drug efficiency. In the present report, studied a correlation of activity of as many as 13 anti-bacterial drugs in terms of global reactivity descriptors under paradigm of QSPR/QSAR study. The global descriptors nicely correlate the variation of activity with structures of the drug molecules. Wright JB. The Chemistry of the Benzimidazoles. Chem Rev 1951;48;397-541. Preston PN. Synthesis, reactions, and spectroscopic properties of benzimidazoles. Chem Rev 1974;74:279-314. Preston PN. Benzimidazole and congeneric tricyclic compounds. In: Weissberger A and Taylor EC (eds. ), New York: John Wiley and Sons, USA 1980;63-147. Grimmett MR. Comprehensive heterocyclic chemistry. In: Pots KT (ed. ), 1984; pp: 345-498. Hoffman K. Imidazole and its derivatives. In: Weissberger A (ed.). The chemistry of heterocyclic compounds. New York: Interscience Publishers Inc., USA 1953; pp: 247-317. Ates AZ, et al. Synthesis and antioxidant properties of novel benzimidazoles containing substituted indole or 1,1,4,4-tetramethyl-1,2,3,4-tetrahydro-naphthalene fragments. J Enzyme Inhib Med Chem 2005;20:325-331. Goker H, et al. Synthesis of some new 2-substituted-phenyl-1H- benzimidazole-5-carbonitriles and their potent activity against Candida species. Bioorg Med Chem 2002;10:2589-2596. Goker H, et al. Synthesis and potent antibacterial activity against MRSA of some novel 1,2-disubstituted-1H-benzimidazole-N-alkylated-5-carboxamidines. Eur J Med Chem 2005;40:1062-1069. Desai KG and Desai KR. Green route for the heterocyclization of 2-mercaptobenzimidazole into beta-lactum segment derivatives containing -CONH- bridge with benzimidazole: Screening in vitro antimicrobial activity with various microorganisms. Bioorg Med Chem 2006;14:8271-8279. Kazimierczuk Z, et al. Synthesis, antiprotozoal and antibacterial activity of nitro- and halogen o-substituted benzimidazole derivatives. Acta Biochim Polon 2002;49:185-195. Mohammad BG, et al. Synthesis and Antimicrobial Activity of Some New 1-Alkyl-2-alkylthio-1,2,4- triazolobenzimidazole Derivatives. Arch Pharm Res 2006;29:26-33. Pawar NS, et al. Studies of antimicrobial activity of N-alkyl and N-acyl 2-(4-thiazolyl)-1H-benzimidazoles. Eur J Pharm Sci 2004;21:115-118. Dubey R, et al. Synthesis and anthelmintic activity of 5(6)-(benzimidazol-2-ylcarbamoyl) and (4-substituted piperazin-1-yl)benzimidazoles. J Med Chem 1985;28:1748-1750. Mavrova AT, et al. Synthesis and antitrichinellosis activity of some bis(benzimidazol-2-yl)amines. Bioorg Med Chem 2007;15:6291-6297. Ravina E, et al. Antiparasitic activity of some New Caledonian medicinal plants. Arzneim Forsch 1993;43:684-694. Starcevic K, et al. Synthesis of antiviral and antitumor activity of 2-substituted-5-amidino-benzimidazoles. Bioorg Med Chem 2007;15:4419-4426. Kubo K, et al. Nonpeptide angiotensin II receptor antagonists. Synthesis and biological activity of benzimidazoles. J Med Chem 1993;36:1772-1784. Ram S and Wise DS. Synthesis and biological activity of certain alkyl 5-(alkoxycarbonyl)-1H-benzimidazole-2-carbamates and related derivatives: a new class of potential antineoplastic and antifilarial agents. J Med Chem 1992;35:539-547. Lazer ES. Benzimidazole derivatives with atypical anti-inflammatory activity. J Med Chem 1987;30:726-729. Lackner TE and Clissold SP. Bifonazole: A review of its antimicrobial activity and therapeutic use in superficial mycoses. Drugs 1989;38:204-225. Ito K, et al. Pharmacological studies of a new non- steroidal anti-inflammatory drug: 2-(5-ethylpyridin-2-yl) benzimidazole (KB-1043) Arzneim Forsch. Drug Res 1982;32:49-55. Navarette VG, et al. Synthesis and antiparasitic activity of 2-(trifluoromethyl)-benzimidazole derivatives. Bioorg Med Chem 2001;11:187-190. Katiyar SK, et al. Antiprotozoal activities of benzimidazoles and correlations with beta-tubulin sequence. Antimicrob Agents Chemother 1994;38:2086-2090. Li YF, et al. Synthesis and anti-hepatitis B virus activity of novel benzimidazole derivatives. J Med Chem 2006;49:4790-4794. Kidwai M, et al. Synthetic strategies and medicinal properties of beta-lactams. Curr Med Chem 1999;6:195-215. Deshmukh AR, et al. Azetidin-2-ones, synthon for biologically important compounds. Curr Med Chem 2004;11:1889-1920. Diurno MV, et al. Synthesis and antimicrobial activity of 1,3,4- triaryl-2-azetidinones. Il Farmaco 1992;47:239-247. Alcaide B and Almendros P. Beta-lactams as versatile synthetic intermediates for the preparation of heterocycles of biological interest. Curr Med Chem 2004;11:1921-1949. Singh SG and Boycie JM. Synthesis of 2-azetidinones from 2-diazo-1, 2-diarylethanones and N-(2- thienylidene)imines as possible antimicrobial agents. IL Farmaco 2005;60:727-730. Vaccaro WD, et al. Carboxy-substituted 2-azetidinones as cholesterol absorption inhibitors. Bioorg Med Chem Lett 1998;8:319-322. Ansary KF and Lal C. Synthesis and biological activity of some heterocyclic compounds containing benzimidazole and beta-lactam moiety. J Chem Sci 2009;121:1017-1025. Daniels O, et al. Gaussian Inc. Wallingford CT 2009. Parr RG and Pearson RG. Absolute hardness: companion parameter to absolute electronegativity. J Am Chem Soc 1983;105:7512-7516. Parr RG and Yang W. Density Functional Approach to the Frontier-Electron Theory of Chemical Reactivity. J Am Chem Soc 1984;106:4049-4050. Parr RG, et al. Electrophilicity Index. J Am Chem Soc 1999;121:1922-1924. MINITAB is a Statistical Software of STATSOFT Inc., USA.